Voting in Virginia – Killing Spiders! Ever since becoming a Virginian four years ago, going to the polls to vote makes me pensive. The thing that struck me most the first time I voted here — during the 2009 General Election — was how close campaigns are allowed to distribute literature at polling places. 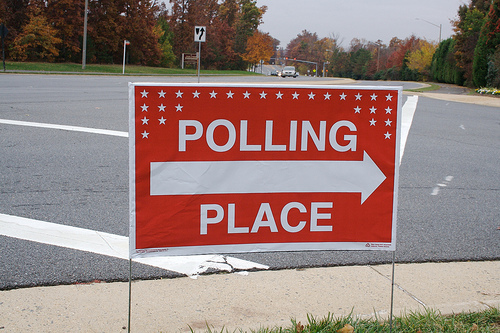 Candidates or their supporters have to stay 40 feet away from the door of the polling place. In my native state, campaigners have to stay at least 300 feet away. This morning, as I walked between the Democrat and Republican tents lined up along the sidewalk outside of my local elementary school, I came to a conclusion: Virginia really doesn’t like for people to vote. The rules for absentee voting are very strict. Early voting is nearly non-existent. This year, the General Assembly (what’s called a legislature in most other states) passed an even more strict Voter ID law. This year voters have to possess particular documents to prove their identity before being able to cast a ballot. Next year, a photo ID will be required. All of these things are designed to keep people from voting. In a state where turnout is typically abysmal for state elections — since they are held in the bizarre odd year, instead of during the Presidential cycle — one would think that too many people voting would be a good thing. But there’s a big problem when a lot of people vote. They elect candidates that appeal to the average voter. Special interest loses its edge. Many people don’t understand why voter ID laws are bad for democracy. After all, most of us are accustomed to flashing our driver’s licenses for a variety of reasons. Many of the arguments in favor of voter ID laws seem to make sense — who wouldn’t want to take steps to prevent voter fraud? Proponents of voter ID laws conjure up images of busloads of undocumented immigrants posing as registered voters and throwing the election. It appeals to latent — and sometimes not so latent — racist attitudes among the electorate. Those arguments overlook a few facts. The biggie: Virginia hasn’t prosecuted anyone for committing election fraud by impersonating a voter. That’s because that’s not the way election fraud is committed. Rounding up unregistered voters to impersonate registered ones is too difficult — and obvious. It can’t be committed in enough volume to sway even the closest race, especially a statewide or national one. The most common type of fraud is committed by election officials. It’s much easier to get a handful of people to conspire to vote the ballots of no-shows on election day than to round up a busload of people to pretend to be someone else. Hence, the tales of dead people voting. A dead person doesn’t vote because someone walks into the polling place pretending to be them. A dead person votes because an election worker (1) knows they are dead (2) doesn’t remove them from the book, and (3) votes their ballot. And with voter turnout at less than 50 percent, there are a lot of unused ballots that can be voted on election day if such a scheme were to occur. Even that type of insider-driven election fraud is harder to pull off these days. Technology makes it more complicated than checking a few boxes on unused ballots. I walked up to the workers manning the election book — which is now on laptop computers — and handed her my Virginia voter registration card. She scanned the bar code, bringing up my file. Meanwhile, another woman there was arguing, mostly pleasantly, with one of the workers. It seems she had moved (across the street) and they were quibbling over whether she could vote. She didn’t have the required voter registration card, and her Virginia driver’s license had her old address on it. Eventually they determined that since she was registered in that precinct, she could vote. Voter ID laws — especially the ones that require photo ID — really don’t keep unregistered voters from voting. They keep registered voters from voting. Why, do you say, would policymakers want that? Because the people most likely to have difficulty getting a photo ID are the very old, the very young, or non-white. Keep those groups from voting and, guess what? Special interest has a better chance of running rampant. After all, college students, senior citizens and minorities tend to favor candidates that like social programs. When you fund a lot of social programs, you can’t fund all that special interest. If my grandmother were alive today she would be unable to vote in Virginia when photo ID laws go into effect. And she would have a difficult time voting now, since she never had a driver’s license, never worked (no employee ID card), never attended college (no student ID) and none of the utilities where in her name (no utility bill with her name and address). You may think — gee, all she has to do is go to the DMV and get a non-driver ID card. Sure, but after a 101-year-old woman gets to the DMV, takes the number and waits hours for her name to be called, how does she prove her identity? A birth certificate? I’m not sure Grandma’s birth was ever recorded. She was born at home on a farm in the hills of West Virginia in 1912. For the purpose of this blog post, I tried to find her birth record in the county where she was born. The courthouse there burned down many years ago and the originals of the older records aren’t available. The state department of vital statistics didn’t have her birth certificate, either. Even if she could get her birth certificate, it would be a process to navigate — on the phone or in person. And it would cost money to get the official copies of her birth record as well as the ID card. Energy. Time. Money. All so that a 101-year-old woman — who was 8 years old when women won the right to vote — could cast a ballot on election day. Why would policymakers want to make it difficult for someone who proudly voted all of their life to continue to vote? The right to vote isn’t supposed to cost you anything. If it does, that’s called a poll tax, and those became illegal many years ago. But this is Virginia. The same state where the Racial Integrity Act of 1924 kept mixed race Virginians and native Americans from being issued birth certificates. The diabolical law — which also criminalized interracial marriage and permitted involuntary sterilization of the poor, minorities and the mentally ill — wasn’t fully repealed until 1975. Do you get it now? Voter ID laws are designed to keep people who aren’t white from voting. I had a hard time believing it, too. Then I delved into the nasty history of racism in Virginia and realized that we were the capital of the Confederacy long after the Civil War ended. Today, Virginia will elect a Roman Catholic Governor. That might surprise some of you — after all, if one were to believe the ads, only one of the candidates is Roman Catholic. But yes, both the Democrat and Republican candidates are Roman Catholic (the Libertarian candidate is a non-denominational Christian, but he isn’t close enough in the polls to be a contender). In 1963, when President John F. Kennedy was elected, being a Catholic candidate was a big deal. Today, not so much. Some voters may be surprised to learn that the candidates share a faith because one of them tends to want to legislate his religious views and the other does not. He’s even endorsed by a religious organization that has been making repeated robo-calls to my house. The religious aspect appeals to a lot of voters. After all, don’t we all want someone in office who shares our values? What’s wrong with making things that are against your religion illegal? Next time, the winning candidate might be someone of a different faith. You wouldn’t like that, now would you? How dare they go imposing their religion upon you! Yep, the founding fathers had a few good ideas (despite being a bunch of old white guys) and separation of church and state was one of them. If Grandma were alive, how would she vote? Despite being a very religious (albeit Protestant) conservative Republican, Grandma looked with disdain upon men who “don’t believe in preventing babies.” Even though she was born in 1912, Grandma was concerned about making sure women had access to birth control. We never discussed her specific views regarding reproductive rights, but I had the impression she was pro-choice, or at least non-judgmental. No wonder they want to make it hard for her to vote! Next PostDo I look like I need a handyman?